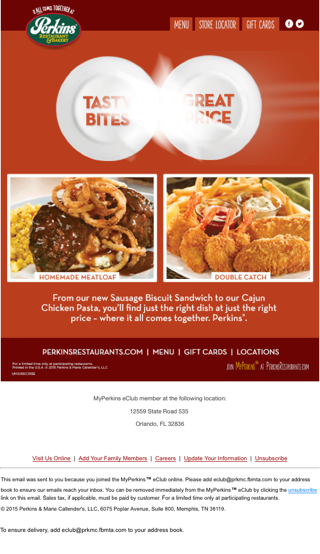 Subject: Now featuring new items on the Great Plates $4-$8 Menu at Perkins! ********************************************************* * ********************************************************* Now Featuring New items on GREAT PLATES $4 TO $8 at Perkins! $8.00 NEW! CAJUN CHICKEN PASTA Cajun-spiced and sliced chicken breast, smoked sausage, red peppers, tomatoes and sauteed onions combined with thin spaghetti in a rich Cajun butter sauce. NEW! MONSTER BAKED POTATO A jumbo-sized baked potato loaded with applewood smoked bacon, American cheese, beef gravy and sour cream. Served with a fresh garden salad. HOMEMADE MEATLOAF Savory sweet-glazed meatloaf over real mashed potatoes, topped with crispy Onion Tanglers® and beef gravy. With buttered corn and dinner roll. SUNRISE BURGER* USDA 100% Angus burger topped with an over-medium egg and American cheese on a brioche bun with lettuce, tomato, onion and pickles. Served with fries. DOUBLE CATCH Two crispy panko-breaded cod fillets, paired with four jumbo fried shrimp. Served with fries, cocktail and tartar sauces. $7.00 NEW! CALEB'S BREAKFAST CLUB Oven-roasted Butterball turkey, applewood smoked bacon, American cheese, mayo, lettuce tomato and on over-medium egg on grilled sourdough bread. Served with tots. MUSHROOM & SWISS OMELETTE A three-egg omelette with grilled fresh mushrooms and melted Swiss cheese. Served with three buttermilk pancakes. OPEN FACE TURKEY SANDWICH Oven roasted Butterball® turkey, hand-carved and served on real mashed potatoes and toasted bread with turkey gravy and a side of cranberry sauce. $6.00 BACON GRILLED CHEESE American cheese, Swiss cheese and bacon on grilled sourdough bread, served with fries. BIG BLT Six strips of crisp bacon with lettuce, tomato and mayo on toasted whole wheat bread. Served with fries. CHICKEN CLUB SALAD Sliced chicken, applewood bacon, tomato, and American cheese on garden greens, served with choice of dressing. $5.00 NEW! SAUSAGE BISCUIT SANDWICH Grilled sausage patty tucked inside a warm biscuit, served with breakfast potatoes. HAMMIN' EGGER Two scrambled eggs, diced ham and American cheese with hash browns and toast. $4.00 FABULOUS FIVE* One egg, two bacon strips or two sausage links and two buttermilk pancakes or toast. EGGS IN A HOLE* Two slices of sourdough bread grilled with eggs, cooked over-medium, in the middle. With hash browns and two bacon strips or sausage links. Hope to see you soon! --> See Menu http://prkmc.fbmta.com/a/1/45109398978/45097741590/default.aspx --> Find a location http://prkmc.fbmta.com/a/1/45109398978/45097741591/default.aspx This email was intended for: Mark Taylor , 34747 Join the Conversation --> Facebook http://prkmc.fbmta.com/a/1/45109398978/45097741597/default.aspx --> Twitter http://prkmc.fbmta.com/a/1/45109398978/45097741598/default.aspx ********************************************************* --> Visit Us Online: http://prkmc.fbmta.com/a/1/45109398978/45097741584/default.aspx --> Add Your Family Members: http://prkmc.fbmta.com/a/1/45109398978/45097741585/default.aspx?_u=aHR0cDovL3Bya21jLmZibXRhLmNvbS9GYW1pbHlKb2luL0Zvcm0uYXNweD9TaXRlPTVjNWM3OTdlLTJkNzktNGQwMC1iZjMzLTJlZWNkMmMxYzRkNyZNZW1iZXI9Y2Y4MDE1MzE5Nzc4NDY4OTk2Mzk3MTVhZDRkNTk3MmEmTmV3PTAmU2tpcD0w0 --> Careers: http://prkmc.fbmta.com/a/1/45109398978/45097741586/default.aspx --> Update Your Information: http://prkmc.fbmta.com/a/1/45109398978/45097741587/default.aspx?Member=cf801531977846899639715ad4d5972a This email was sent to you because you joined the MyPerkins™ eClub online. Please add eclub@prkmc.fbmta.com to your address book to ensure our emails reach your inbox. You can be removed immediately from the MyPerkins™ eClub by clicking the unsubscribe link on this email. Sales tax, if applicable, must be paid by customer. For a limited time only at participating restaurants. © 2015 Perkins & Marie Callender's, LLC, 6075 Poplar Avenue, Suite 800, Memphis, TN 38119. To ensure delivery, add eclub@prkmc.fbmta.com to your address book. --> Unsubscribe: http://prkmc.fbmta.com/a/1/45109398978/45097741588/default.aspx?_u=aHR0cDovL3Bya21jLmZibXRhLmNvbS9tZW1iZXJzL1Vuc3Vic2NyaWJlLmFzcHg_TWVtYmVyPWNmODAxNTMxOTc3ODQ2ODk5NjM5NzE1YWQ0ZDU5NzJhJk1haWxpbmc9NDUwOTcxOTk1OTk1 If you are unable to click any of the links above, please copy and paste the link into the 'Address' field of your web browser. --------------------------------------------------------- This message is powered by Fishbowl. 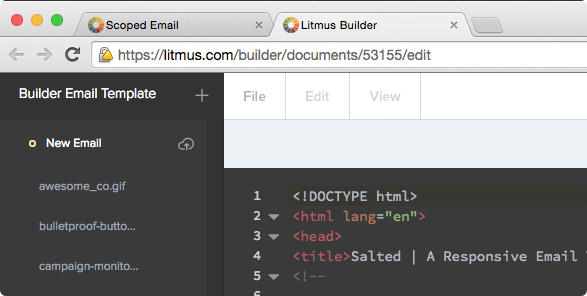 to completely disallow text resizing.